DIRECTV’s new menu system for Genie DVRs and clients continues to be polarizing. The menus have already been improved and more changes are on the way. Still, there have been complaints about the amount of contrast. As I showed you in this recent article, It’s still possible to tell what channels you don’t get. Channels you don’t get are greyed out in the guide. The problem is, they’re not greyed out as much as they used to be. This has led some people to complain. The good news here is that there’s an easy way to hide all the channels you don’t get. It’s always been there, and it’s actually pretty easy to do in the new menu system. While you’re watching live TV, press INFO on your remote. That’s really all it takes. You can do the same thing in the guide by pressing the zero button, choosing “Change Favorites List” and choosing Channels I Get. Or, you can set up a favorites list. DIRECTV receivers let you have two favorites lists. You can have one for channels you really like, one for ones your spouse really likes, or any way you want to break them up. In these screen captures, you can see that I’ve created a custom favorites list that I’ve called “FAVORITES.” The other list isn’t set up yet. 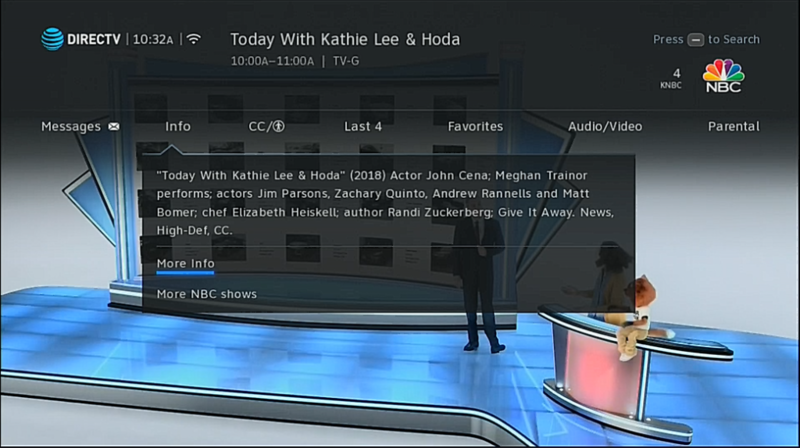 To set up a favorites list, choose “Setup Custom 1” or “Setup Custom 2” and you’ll be taken to a screen where you can choose the channels you want in the list. 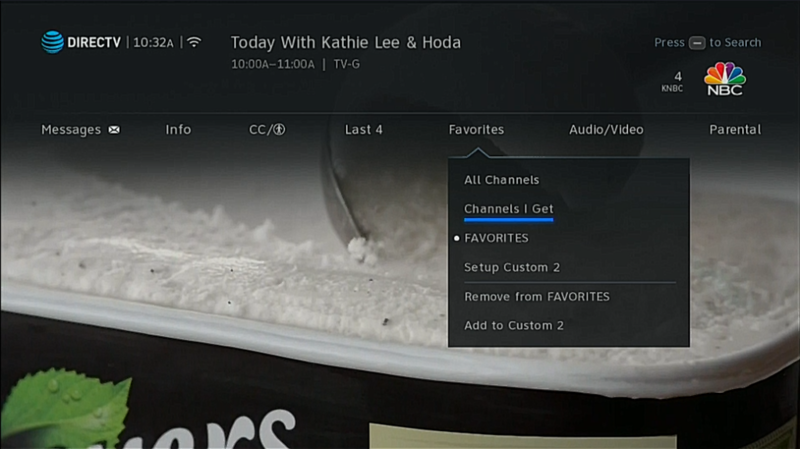 You can also add or remove channels to a favorites list right from the info screen. You never have to see channels you don’t get. I certainly agree that the display of channels you don’t get isn’t as “contrasty” or “greyed out” as it used to be. I hope that’s one of the changes coming down the pike in the next few months. In the meantime though, you don’t have to look at any channels you don’t get. Just set up a favorites list or choose “Channels I Get” which will automatically be up to date. Will the Channels I Get list show channels I don’t get? I know this sounds like a silly question. Actually this was a problem in the distant past but as far as I know it’s been fixed. This bug was squashed with the help of dedicated testers years ago. From time to time I do see something in my Channels I Get list that is greyed out but it’s very rare. It usually happens during new channel launches and fixes itself very quickly.